Marine Le Pen's far-right National Front (FN) has achieved a historic high watermark in local elections, but has failed to outrun Nicolas Sarkozy's center-right UMP, according to a partial count. According to official partial results the UMP and its allies together secured around 30 percent of votes. The anti-EU FN received around 26, about 0.5 percentage points above its European elections showing last year. “The National Front has done 10 points better than it did in the 2011 local elections but its progress has stalled. It seems to have reached a ceiling,” said Bernard Sananes, head of the polling organization CSA on BFMTV. 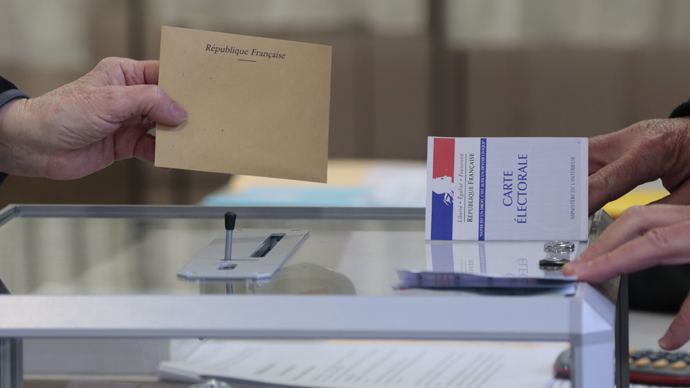 Of the total 2054 local voting districts, the UMP and its conservative allies took 170 seats outright, ahead of the left's 44 and six for the FN, according to the interior ministry's count. President Francois Hollande's ruling Socialist Party came third with around 21 percent of the vote. “This first round demonstrates the French people’s profound desire for change,” the ex-president said. Le Pen, commenting on the vote, said that the mainstream parties are conspiring against her party. Despite predictions that had them neck and neck in recent weeks, the FN is thought to have secured 26.3 percent of the vote, with the UMP on 29.2, said research company Ifop, perhaps due to an unusually high voter activity for an election for offices that hold limited power. Turnout was around 50 percent, six percent higher than at the last local election four years ago, according to pollsters Ipsos. "I would like to thank the French people for showing their strong civic position to vote en masse, despite various attempts to lead them away from the ballot box," said a statement from Sarkozy. The ruling Socialist Party of President Francois Hollande is expected to come third with 21.4 percent of the vote. The 101 council departments are the most local tier of elected representatives in France, and wield little political power, outside of transport and education policies. But the results are considered to be a bellwether for the presidential elections in two years, which will likely be contested by Sarkozy, Le Pen and Hollande, as in 2011. FN received just over 15 percent of the vote during the first round of the last elections in 2011. Sticking to core issues such as the economy and immigration, Le Pen has managed to garner a lot of support amongst a French population who have become weary with the current government. Hollande, whose popularity ratings are at record lows, is expected to lose about half the 61 departments that his Socialist Party currently controls. "We'll get stuck into the regions and then we're off to invade the Elysee (presidential palace)," Le Pen declared this week, AFP reports. The leader of the Front National has seen her party enjoy success in the recent European elections. They secured 25 percent of the votes and took over a dozen municipalities in local elections last year. The party also secured a historic victory in 2014, winning two seats in the upper house of parliament for the first time. However, given the nature of the two-round election, it is expected the FN will only take control of a few departments. The second ballot, which takes place on March 29, is likely to see many UMP and Socialist voters switching allegiance to whichever party has the best chance of winning, in order to keep Le Pen’s right party out of power. Fifty percent of the seats will be contested by women following recent reforms made by the Socialist Party, which made it compulsory for councils to elect both a female and male councilor, with both candidates standing on the same ballot, which is known as a ‘binome,’ meaning ‘partner’ in English.